Here to Share and Help you on your artistic journey. My mission is to inspire and encourage your own creativity. We are all born creative, that’s my belief. Art is one of the greatest gifts we have to illumine,encourage and inspire others. Are you ready? ”I think this is the beginning of a beautiful friendship”! 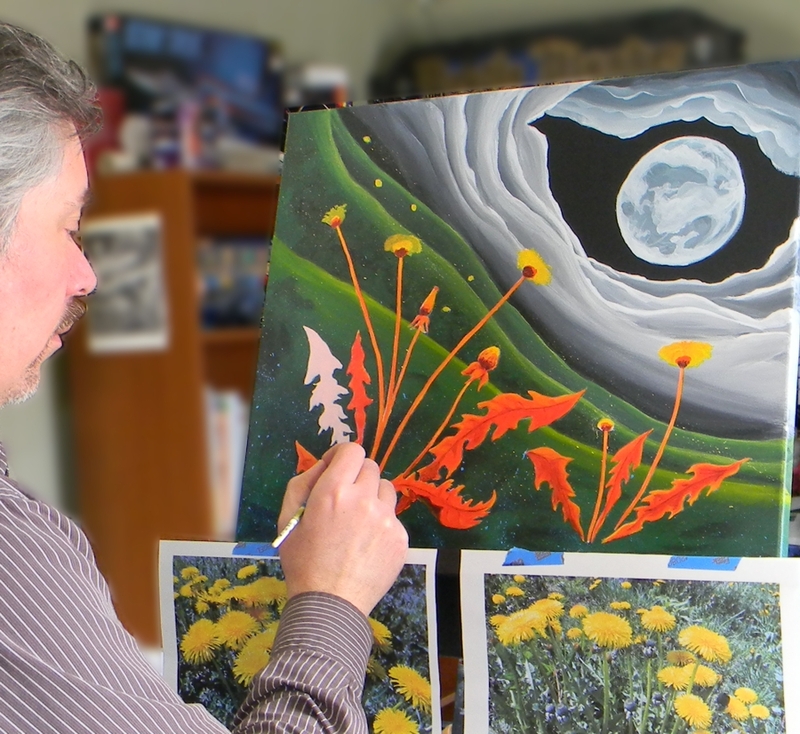 Kevin Cameron is a self taught artist who sold his first painting at the Apple Bin Gallery in Kentville, NS almost 20 years ago. He has painted holiday window murals for a local coffee shop helping to brighten spirits during the season. Kevin was hired to illustrate labels for a local candle company which were used for product across Canada and the Eastern United States. He illustrated a children’s book as well as a biography of a woman’s escape from domestic abuse. Kevin also provided live and studio caricature services in the Kentville – Windsor community. His first mural was at the age of 5 or 6 when he drew a large man’s face with stubble and a cigar. He has done work in homes designing and painting script, art and murals. I exist in cyberland here : kevincameron.ca , and here: kevincameronart on facebook. thanks for liking the post. i feel stupid and just noticed the top picture is actullay upside down. Thank You! I just posted the one with a link to you. Hope you like it. I’m just fumbling my way around WordPress..it’s quite new to me. Thank you . I will check it out… a litlle slow in getting back to you…apologies! Hello Kevin, I just discovered your website… I really like your artwork! Hi, Kevin. Thank you for the like on Reaching For Duck from my blog. It really means a lot, especially from an artist such as yourself. Keep up the work. Thanks Andrew. Actually I thought what you did was pretty cool.Take care!